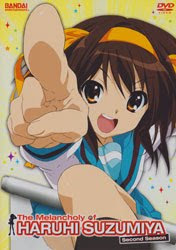 The Anime Archivist: Video Backlog: "The Melancholy of Haruhi Suzumiya: Second Season"
Video Backlog: "The Melancholy of Haruhi Suzumiya: Second Season"
Story Outline: This “second season” is actually part of a 2009 renewal of the show and contains episodes that were slotted into the existing 2006 TV series. The first episode has Mikuru transporting Kyon back two years to the incident of what could be the source of Haruri’s obsession with aliens, time travellers and ESPers. Along the way the older Mikuru and Nagato helping along the way. Then after Haruri forces everyone to join her on a gigantic “to do” list in the final two weeks of the summer holidays, it becomes apparent that have been repeating the same two weeks over and over again. It’s up to Kyon to break them out of this cycle and appease Haruri so she believes that she has done everything she wants to during summer. The final arc involves the creation of “The Adventures of Mikuru Asahina Episode 00”. However Haruri’s ideas for the movie, such as talking cats and super powers, begin appearing in real life. They must find way to stop Haruri’s fantasies taking over reality. Mini Review: Admittedly I wasn’t the biggest fan of the original series. Once you reveal the gimmick and play the show in chronological order, it’s not all that interesting, especially stuff like “Remote Island Syndrome” arc. However the show did really shine at a number of points and was pretty clever and pretty much succeeded in what it wanted to do. The big problem I had was the fact there was a number of elements in the show which referenced the novels (none released commercially in English at the time of the show’s US release) which were never explained in the TV series. Sorry, I’m not going to read a book so I can understand a TV show. If it’s not in the show, then that’s bad writing in my book and it alienates new people coming into the franchise who haven’t or have no desire to read the novels. Some of the little unexplained references are solved in this second season which is nice. It’s odd, I kind of had more fun with this season than the first. I also didn’t mind the infamous “Endless Eight” episodes. Contrary to what I had heard, they aren’t the same episode over and over. The animation, clothes the characters wear, camera angles and a lot of other little changes are different every time. However as the time period in each episode covers a fortnight, a bit more variation could have been included in each episode. Towards the end of the arc I became a little annoyed as no progress was being made by Kyon. At least they could have shown him trying something different every time to end the time loop. The final arc about the making of the movie was fun, but Haruri just becomes more and more unpleasant in every episode, to the point of me wishing her dead. She really needs her arse kicked. That kind of spoiled the last arc for me. Comparing Bandai’s massive special edition of the first season with its additional discs in TV broadcast order, bonus CDs, cosplay items and an intricate chipboard box, with what we got for the second season is amusing. It’s just one cheap looking five disc collection pack with a bonus two track CD. Oh, how the US industry has fallen in such a short time. I was quite surprised with this show. It’s a lot better than people have been saying. 7.5 out of 10. Remaining Backlog: 17 months (it's much easier this way than listing the number of discs).